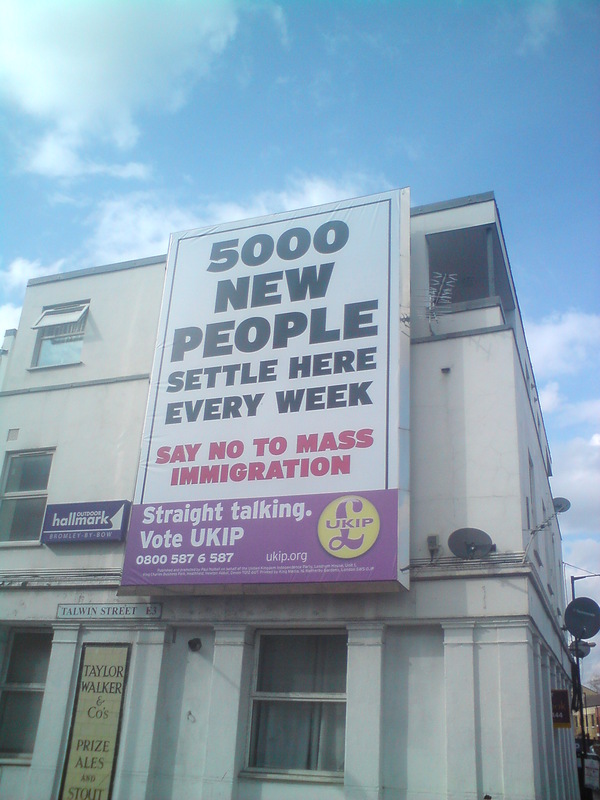 Election 2010: Straight Talking from UKIP? As if proof were needed that this year’s UK general election is going to be the most personal in years, UKIP has blunderbussed its way into East London with all the subtlety and tact that you would expect from a party led by the political equivalent of Alan Partridge. The reckless insensitivity of placing this poster in Bromley-by-Bow, a council ward with a 40% Bangladeshi majority, is as staggering as the its wording is ironic. Straight talking? The euphemistic use of the term ‘new people’ would suggest otherwise. I don’t know who the local UKIP candidate is, and quite frankly, I don’t care. Despite this, the incumbent Labour MP, Jim Fitzpatrick has plenty of reason to feel unsettled after upsetting the local Asian population last summer by walking out of a Muslim wedding. If, as expected, the general election produces the largest turnover of MPs in a generation, then there are going to be some fascinating battles to be fought in London constituencies. Looking further north, the show-down in Hampstead and Kilburn between Oscar-winning incumbent MP Glenda Jackson and climate change activist Tamsin Omond should be very interesting indeed. Over the next month or so I will endeavour to blog more about politics in the run up to the election, but for now all I want to say is there has never been a more worthwhile time to register to vote and make your opinion heard. It’s not hard to find fault with the Evening Standard, and even easier to find puns. Since going free their output has been of varied quality, lagging behind Metro for news coverage on some days. It’s clear to see that Standards are slipping. In this context, their splash today is all the more heartening. Rarely do newspapers spell out their intentions as clearly as this. For me this is journalism at its hard-hitting, unashamedly purposeful best. David Cohen tackles the lingering issue of urban poverty, wading into child burials, unemployed graduates and single parents without a hint of Bono-esque faux-philanthropism. Whilst there are criticisms of the current Government, that is never allowed to overtake the dispassionate social observation that underpins this feature. What Cohen achieves is an eye-opening read for commuting Londoners, and with an estimated audience of 1.4million, the impact on the electorate will surely be significant. The full article is well worth a read, and the Standard editorial team are clearly 100% behind it, giving it its own mini-site. The incredible gulf between rich and poor is easily overlooked in London, but from where I live the contrast is blatent. The sight of run-down council houses in the shadows of Canary Wharf makes for a powerful image. The reaction on Twitter has been mixed at best, but for me this redefines what the Standard brings to the freesheet market: an agenda, original journalism and a powerful sense of indignation.